It’s not just that centenarians are tougher than everybody else. Turns out they’ve got statistics on their side. According to a study by Leonid A. Gavrilov, PhD’98, and wife Natalia S. Gavrilova, SM’04, both researchers on aging at Chicago’s National Opinion Research Center, people raised on farms out West are more likely to live to 100 than urbanites back East. October and November babies might expect to outlast those born between April and June. 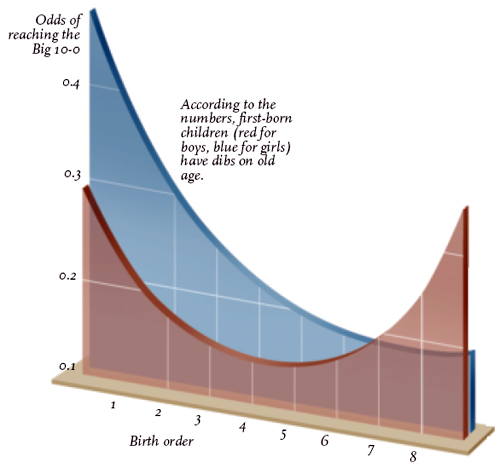 Up to age 110, men’s mortality outpaces women’s, and the life expectancies of both increase for those born of young parents less likely to have age-damaged sperm and eggs. Location: Hammer Health Sciences Center 701 W. 168th St.
Speaker(s) Name: Leonid Gavrilov, Ph.D. and Natalia Gavrilova, Ph.D.
11:30 - Dr. Bertie Lumey kindly invited for a lunch at Faculty Club with Lina Titievsky, Dr. Victoria Moceri, Dr. Susan Harlap and Dana March. After that a meeting with Dr. Arnold Sher. This Scientific Blog represents research efforts aimed to understand the mechanisms of aging and longevity in order to extend healthy and productive human lifespan. Leonid Gavrilov - Biosketch for Symposium "Living to 100 and Beyond"
Natalia Gavrilova - Biosketch for Symposium "Living to 100 and Beyond"
Scientific Lecture "Reliability theory of aging"
Scientific Lecture "Biodemography of human longevity"
Interview with Dr. Leonid A. Gavrilov, Ph.D.
Subject Index for "The Biology of Life Span"